We are about half way through Cork's Midsummer Festival for 2006 which is running from the 20th of June to the 1st of July. NoFit State Circus' ImMortal2 is one of the events that was held on Mardyke Walk last week. I hadn't been to see anything organised by the festival until last Friday night when I went to see ImMortal2. NoFit State Circus was established in 1986 in Cardiff, Wales and is now celebrating 20 years of its unique brand of Circus. 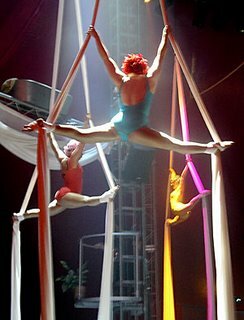 In 2005 ImMortal2 was rated as the best ever UK Circus show. The show was the hit of the Edinburgh fringe and won a total of four major international awards. The show is unusual and to be honest I didn't know what to expect as we were greeting by guys in kilts and waistcoats, and ushered into a space age tent. Once inside the tent we were addressed by a lovely accordion player with a fetching flower clip in his hair and introduced to the night's performance. There was excellent live music throughout the performance which really added to the atmosphere and drama of the show. The audience moved at different times during the show depending on what the performers were doing. There was tightrope walking, trapeze artists and unbelieveable feats of balance. There was always something going on. Sometimes it was loud and frantic, then it was beautiful and mesmerising but it was never boring. Definitely an interesting way to spend a Friday night. Ya, I was lucky enough to see this circus too and it was excellent... even got to help one of the performers take off her dress, now that's audience participation! # posted by Pure Cork Boy : June 26, 2006 2:47 p.m.